Bladderwrack, Irish Moss and Nopal. Bladderwrack : Iodine, nutrient support. Irish Moss : Joint and nutrient support. Nopal : Diabetes, nutrient support. Bladderwrack Sea Moss Plus (Similar to Dr. Sebi's Bromide) is good for the bones and thyroid gland. It is good for individuals that suffer from bad breath, pulmonary illnesses, respiratory issues, dysentery. Bladderwrack Sea Moss Plus Capsules acts as a natural diuretic, it suppresses the appetite regulates bowels and its helpful to the digestive system. 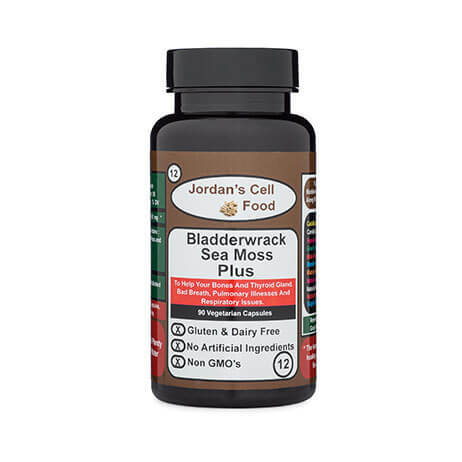 Bladderwrack Sea Moss Plus Capsules are helpful in the overall digestive system. Bladderwrack Sea Moss Plus can be used by itself as a general cleanser or with other herbal combinations. The more combinations that you use together, the more you will cleanse the entire body down to the intracellular level.